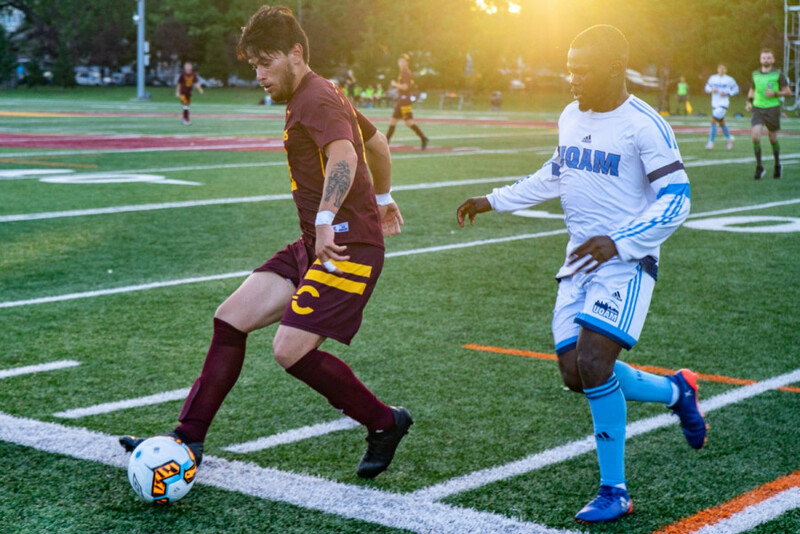 In the 80th minute the Université du Québec à Montréal Citadins got everything they needed for a win in their first game against the Concordia Stingers. Citadins’ Mohamed Derouiche scored a late goal that allowed his team to remain on top of the row. For him, it was more than just a goal. This was his first goal ever with the Citadins but more importantly, his first goal ever in Canada. The game’s most valuable player is a native of Algiers, Algeria. He came to Canada for the first time a week ago as he put his feet on Canadian soil for the first time in late August. Before last week, Derouiche was playing in Algeria on the reserve team in the professional league. When he came to Canada, he didn’t want to stop. He wanted to keep playing and pursuing his soccer career. “I’m so happy. I am in love with Canada,” he said eagerly. The UQAM Citadins blasted their speakers in the locker room after the game, shouting at Derouiche as if they had won the World Cup. Citadins’ soccer head coach Christophe Dutarte was pleased with his team’s victory but insisted the team hasn’t clocked in its full potential yet. “The season is young still. The rest of the guys are not physically ready [yet].” He said. As for the Stingers, head coach Greg Sutton thought the result should have ended in a stalemate as goalie Karl Gouabe let in an unlucky goal. “It was an unlucky result, in a sense. Probably should’ve been a 0-0 game. We have a bad turnover in a bad area of the field. The ball got deflected,” said Sutton. “It’s a performance that we’re gonna be able to build on,” he added, as he rushed back to the field to prepare for his second game of the night as the women’s soccer team’s head coach. Stinger Mateo Zazo played his first game as the Stingers’ captain on Wednesday. “He’s been a good player since the last few years he’s been there. He’s been a leader for while,” said Sutton about the young captain. Overall, the Stingers played composedly against their contenders and both teams looked promising with the first game of the regular season behind them. Friday, Aug. 31 will be the Stingers second game as they face the Université du Québec à Trois-Rivières’ Patriotes at Loyola Stadium at 6:30 p.m.